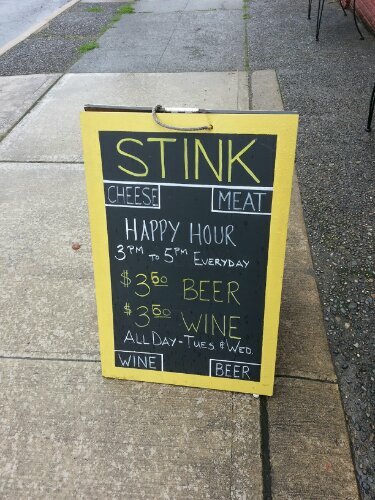 Leave a Comment on A restaraunt named Stink? Whoa. It takes some confidence to hang that moniker above the entrance to a restaraunt. My teacher-self immediately questioned the wisdom of that choice given the generally negative connotations usually associated with the word. In fact, it took a bit of convincing to get my wife to cross the threshold of the establishment. I had to scroll through the generally-positive Yelp reviews for her before it got the nod of approval. Fortunately, we were both happy with the decision. But it wasn’t the delectable charcuterie, or the mouthwatering Proscuitto and Brie sandwich with rosemary-fig confit that my wife ordered (and I finished) that prompted me to share my experience at Stink… It was the PB&J. Well, their version of one. Their version of the grade-school classic is called “The Stinker”, and it’s anything but elementary. This bad boy is two thick slices of multi-grain, which sandwich a generous smear of the obligatory peanut butter, blackberry preserves, crumbled bacon, and – stick with me – a helping of bleu cheese, all of which is grilled to gooey perfection and (like all of their sandwiches) served with a light walnut-sprinkled salad. I didn’t think it would work. Actually, I kinda wanted it to not work, just so I wouldn’t have to kick myself for not thinking of something so obviously delicious before I saw it on a menu. Spoiler-alert: I was obliged to kick myself. It was amazing. Not only did that burst of traditional PB&J flavor throw me immediately back to the days of second grade sack lunches, the salty crunch of the bacon and the creamy yet pungent bleu cheese appealed to my adult palate while elevating the sandwich to a new level. It makes sense why it’s listed on the menu as their bestselling item: it was salty, sweet, satisfying, and pleasantly straightforward, a smart rendition of a traditional bite that’s pleasing to all ages. 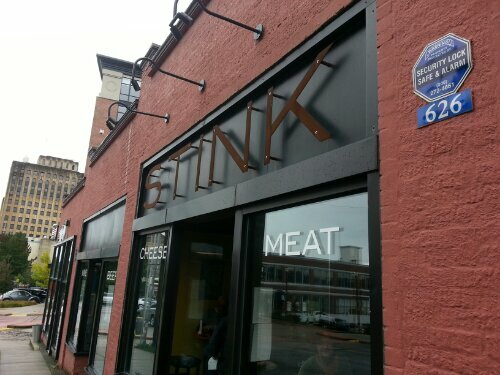 Next time you’re in Tacoma, give Stink a try… You’ll be happy you did.